The International Network of Engaged Buddhists will hold our bi-annual conference on ?The Future of Buddhism, from Personal Awakening to Global Transformation? at Buddhagaya, India, the place where the Buddha was fully enlightened 2,600 years ago. The future of the teachings of the Buddha is at stake. The major task ahead is to make them appropriate for humankind and all sentient beings at least for another 2400 years from now on. In a smaller time span, this year also marks the 150th birth anniversary of Rabindranath Tagore of India, whose life and work truly inspired many of us, who celebrated and shared his ideas and aspirations for harmony, wholeness and integrity. He dedicated his whole life to cultivating these ideas and dreams, especially through his poetry, plays, paintings and innovation in education. For Tagore, growth in science, technology, and material wellbeing should go hand in hand with spiritual growth. One without the other is like walking on one leg. Also, Tagore did not reject the West or industrial civilization per se. Rather he insisted that the West must also learn from the East because it has so much wisdom to offer the West. This balanced and holistic worldview is needed now more than ever, as it is a prerequisite for a sustainable and resilient future for us and for coming generations. Pure reason and pure materialism are as doomed as the pursuit of purely personal salvation. The world view of Tagore is seeing the unity of reason and religion, spirit and matter, and letting them dance together. This is the big vision where science complements spirituality, art complements ecology, and freedom complements equality. For humanity, Tagore argued, the perfect relationship is one of love. He declared that this truth serves as the foundation of the Buddha?s teachings. According to him, we can only reach our freedom through cultivating mutual empathy. To gain freedom we need to liberate ourselves from the fetters of self and from all those passions that tend to be exclusive. It is this liberating principle that we must apply to an imprisoned world. What we call ?progress? or ?development? does not necessary conform to this ideal. With purely material progress, the greed for things tends to become a passion, thereby promoting unbridled competition and confusion. A reign of ugliness spreads like a callus over the whole world. A mere addition to the height of skyscrapers or to the velocity of speed or the latest technological invention like nuclear power plants can lead only to boasting and exaggeration, sometimes with very grave consequences. We are shocked to see in front of our own eyes our arrogance and the illusion that we can somehow control our Mother Earth. The Earth that creates the great Tsunami is the same Earth that has been giving everything to nurture us. We must re-instill the sense of awe that we might have been missing for a long time. We must meditate so that we can rediscover a way to reconnect ourselves to our Mother. This is the age of what the American Buddhist Joanna Macy called the ?Great Turning,? that has been prepared for in many parts of the world. According to her, the Great Turning has been occurring on three simultaneous levels: environmental movements; anti-globalization and re-localization activism; and personal spiritual awakening. Perhaps Tagore?s message may be relevant here. He said ?the time has come for us to break open the treasure trove of our ancestors, and use it for our commerce of life. Let us, with its help, make our future our own, and not continue our existence as the eternal rag-pickers in other people?s dustbins.? Tagore reminds us that, ?Indian civilization has been distinctive in locating its source of regeneration material and intellectual, in the forest, not the city.? Harmony in diversity is the nature of the forest, where monotonous sameness is the nature of industrialism based on a mechanical worldview. This is what Tagore saw as the difference between the West and India. The civilization of the West has in it the spirit of the machine which must move, and to that blind movement human lives are offered as fuel. The Buddha-to-be too left the city in order to search for the truth in the forest. We believe that the Buddha has discovered the Four Noble Truth in the forest on the full moon of May 2,600 years ago. Many of us in Asia embraced the Buddha?s teachings and regarded ancient India as the source of wisdom and compassion. Recently, however, most of us in Asia may still call ourselves Buddhists, but we blindly follow Western civilization, which is based on power and greed and the spirit of the machine worldwide. A civilization based on power and greed is a civilization based on violence. Tagore warned that ?the people who have scarified their souls to the passion of profit making and the drunkenness of power are constantly pursued by phantoms of panic and suspicion, and therefore they are ruthless ? They become morally incapable of allowing freedom to others.? Tagore maintained that ?real freedom is of the mind and spirit; it can never come to us from outside?. He only has freedom who ideally loves freedom himself and is glad to extend it to others ? he who distrusts freedom in others loses his moral right to it. Today the rule of money and greed dominates our society, economy and politics. The culture of conquest is invading our lands and forests through the mining of iron ore, bauxite and coal. Many forest areas, especially in South and South-east Asia have become war zones where every defender of the rights of the forest and forest dwellers is being treated as a criminal. If we are to survive ecologically and politically, where we remain democratic in essence and each citizen is to be guaranteed right livelihood, we need to give up the road to conquest and destruction and take the road of union and conservation. We need to cultivate peace and compassion instead of power and competition. We need to turn once again, to the forest as our perennial teacher of peace and freedom of unity and diversity. We need to take Tagore seriously and follow the Buddha and ancient India as great visionaries for our survival, and the survival of our next seven generations who should enjoy peace and social justice and environmental balance. We need to be culturally sensitive, politically concerned, and socially committed to have the courage to tackle questions of the common good and to point out abusive situations. To be able to see clearly, to be truly aware of the state of the world, we must begin by deprogramming ourselves and be free of prejudice toward those we criticize. By working together with others of good will, we can identify and confront abuses of power. It is critical for people of all faiths and ideologies, as well as atheists and agnostics, to listen to each other as we promote justice and balance through nonviolent means. Equality must be upheld in all situations, in order to have empathy for as well as to stay in touch with the poor and oppressed. To continue the work, we need to inspire the younger generation. We must help them develop freedom, self-reliance, contentedness, compassion, and generosity, to learn to collaborate rather than compete and to appreciate quality rather than excess. The younger generation needs accurate information, not just the propaganda of governments and media. The present financial crisis is an opening for us to encourage these essential values. For our children to realize their potential and come forth as leaders of their generation, we ourselves must be good models. We must be homo sapiens, not homo hipocriticus or homo economicus. We must see through neoliberal economics and free market fundamentalism. Today in Greece, austerity measures, which means privatizing the commons, are being implemented, not for the benefit of the people, but for the super rich to own even more. We must help the next generations develop the critical thinking we have lacked and the capacity for reflection taught by the Buddha to build a sustainable future. We must confront our own greed, hatred, and delusion in order for our societies to be transformed into models of justice and peace. 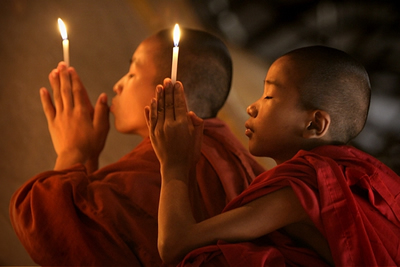 Buddhist meditation teaches proper breathing as the most important element of life. When we learn to breathe in and out mindfully, greed hatred, and delusion naturally transform into generosity, compassion, and wisdom. We are all connected to one another and we can learn to breathe from that place. Meditation is indeed a way of developing clarity, which allows us to see the precision of daily life situations as well as our thought process that we can relate with both of them fully and completely. Throughout the ages, nature has caused a lot of suffering, but today natural disasters are exacerbated by the arrogance of industrialists and scientists. We must respect nature and not regard other living beings as resources to be exploited. Technological developments are not always in our best interest, as seen so clearly with Bhopal, India, and at the Fukushima Daiichi Nuclear Power Station in Japan. We must learn to discern what advances to accept and apply, and which ones to monitor closely or discard. With humility and caring, not just for ourselves but for the next seven generations, we can bring about an era of ahimsa and satyagraha. We can learn from Gandhi, and even from Emperor Ashoka. Bruce Rich has recently published a very important book for all of us to learn from To Uphold the World: The Message of Ashoka and Kautilya for the 21st Century. Some other titles are also very relevant for us such as Glenn Paige?s Nonkilling Global Political Science and David Loy?s A Buddhist History of the West: Studies in Lack, plus my own The Wisdom of Sustainability: Buddhist Economics for the 21st Century ?not to mention the works of the Mind and Life Institute under the guidance of the Dalai Lama to shed light on the common insights of science and spirituality. The Gross National Product was once the universal measurement of economic well being. Today, Gross National Happiness is gaining wider acceptance. Although the economic theory of unlimited growth and nonstop accumulation of capital continues to dominate the World Bank, International Monetary Fund, World Trade Organization, and nearly every government, in recent years, there have been high-profile defections among their ranks. Amartya Sen, Joseph Stiglitz, Jeffery Sachs, and others have expressed their recognition that mainstream economics, if left unchecked, will destroy the world and its peoples. Last year the organizers of the World Economic Forum in Davos, Switzerland, invited Matthieu Ricard, a French Buddhist monk, to deliver a keynote address on Gross National Happiness. Let us hope this was more than a public relations stunt by the rich and powerful. A think tank at Schumacher College has joined with the New Economic Foundation in London to propagate the idea for Buddhist economics to be taught at the university level. The University of Pennsylvania is considering including Gross National Happiness in its Masters? curriculum. Recently Chulalongkorn University and the Sathirakoses-Nagapradipa Foundation in Bangkok collaborate with Bhutan Studies Centre in Timphu established a School of Wellbeing with much concern on Gross National Happiness. The Powers That Be will not give up their privileges voluntarily that they will defend to the bitter end. Violent structures will not crumble by themselves. They need to be pushed?nonviolently. The way forward requires refraining from violence, even as a means to an end. The U.S. in its perpetration of violence in Iraq, Afghanistan, Libya, and elsewhere; China in Tibet and Xinjiang; the military dictatorship in Burma; and other perpetrators of violence are on the wrong side of history. Like Aceh, the three southernmost provinces of the Thai kingdom must be granted a greater degree of self-rule. There is no other way to bring this about except through nonviolence. Mahatma Gandhi employed satyagraha to expose the lies of the British empire. China and many other countries still deceive their people, but the deceitfulness of the ruling classes cannot last forever. Although the mass media as a whole brainwashes us to be addicted to capitalism and consumerism, new technologies offer opportunities for new sources of information, and a world beyond capitalism is possible. Although he came to power through armed struggle, Fidel Castro now condemns mindless violence and has stated that he prefers nonviolence. Despite decades of American terrorism against Cuba, Castro still sees the American people as friends of Cuba and sees young Americans? tilt toward nonviolence as a move in the right direction. Former president Jos? Ramos-Horta of Timor Leste also upholds the virtue of nonviolence and forgiveness. He is willing to forgive and even cooperate with Indonesia despite the latter?s bloody invasion and occupation of his country. He is inspired by Nelson Mandela, who was ready to forgive the crimes of apartheid. Former president of Indonesia Abdurrahman Wahid declared that Gandhi was his role model. The politics in Cambodia, as in many other countries, are full of violence and deceitfulness. But the Dhammayatra movement, founded by the late Maha Ghosananda, a Cambodian Buddhist monk, is a vital and influential force in his country. We can also refer to the Saffron Revolution in Burma when Buddhist monks struggled for democracy and responded to the military dictatorship?s counter-revolutionary brutality with deep meditation and prayers. Likewise in Tibet, monks have nonviolently resisted the Chinese occupation for more than five decades, and the Dalai Lama recently embarked on a path to democratize Tibet nonviolently. The pioneer work by Dr. Ambedkar in reestablishing Buddhism in India has indeed been a great significance and the Indian Buddhists are now growing numerically, socially, politically and spiritually. INEB members need to work more closely with Indian Buddhists, especially at the grassroots. Globalization, the latest phase of capitalism, is a facade of neo-imperialism. More than ever we need self-rule?beginning with personal transformation?and the creation of a new collective subject. To bring this about requires, first of all, internal spiritual change. If we are able to transform greed into generosity, hatred into loving kindness, and delusion into wisdom, we have self-rule. Peace in the world requires the cultivating seeds of peace within. As the Dalai Lama points out, this is difficult, but it is the only way to achieve world peace.